Frederik March 17, 2017 Comment? In advance of Alien: Covenant arriving in theaters on May 19, director Ridley Scott joined stars Katherine Waterston and Danny McBride at the SXSW Film Festival for a screening of the original Alien, followed by new footage from Alien: Covenant. It was there that Fandango caught up with the trio to talk a little more about Covenant and how it differs from Prometheus (it’ll be gorier! ), as well as how it all connects to Scott’s original 1979 Alien movie. 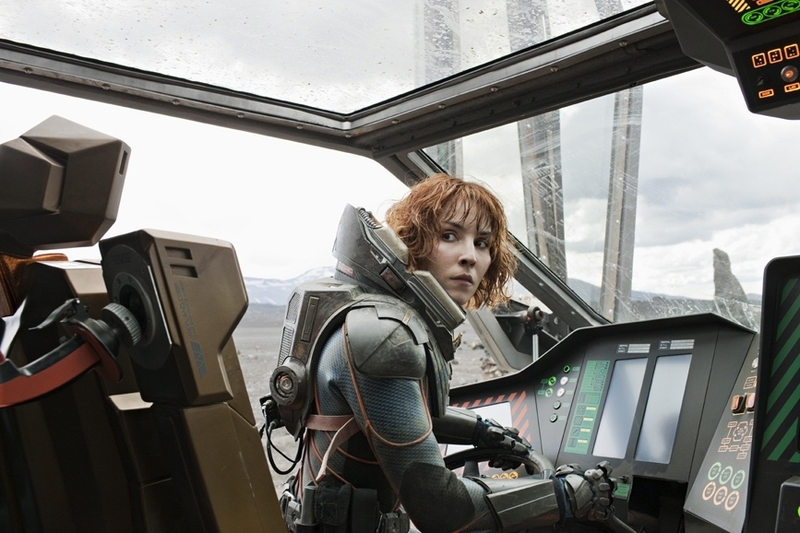 Scott referenced both Fassbender’s android character David, as well as Noomi Rapace’s character, Elizabeth Shaw. They were the only two left alive at the end of Prometheus, and we cut away from the duo as they begin their search for the Engineers’ home world. We’ve known for a while that Rapace would return in some form for Covenant, but how and in what way remains a mystery. So we asked Scott how, exactly, Rapace would return. “Yes, in a way,” he said, confirming she’ll be in the film. “Not fully, but in a way. She was integral to what David carried out later.” Based on those comments it would appear David did something to her or used her in some way that will prove to be a central plot point as far as what David has been up to since we last saw him. You’ll see!” Waterston added. “There are certain things you don’t want to know. You don’t want to know that!” Recently, Scott said he could continue making Alien movies as long as there’s an appetite for them, and that the next film is already written. We tried to ask him just how many were on the books now, and we warn you that the following may be a bit spoilery… “There will be another one before we kind of literally and logically, clockwise, back into the rear back head of [the original] Alien,” he said. We asked Scott what the timeline looked like – would it be Prometheus, Covenant and then this next movie before we arrive at the events of the original Alien. That’s when the answer became a bit foggy as it appears he slips in the title for another movie we haven’t seen yet and positions it between Prometheus and Covenant. “It will go Prometheus, Awakening, Covenant.. fairly integral where this colonization ship is on the way….” Waterston cut in again to stop Scott from spoiling any more information. “You’re giving away too much!” she screamed. “But yes, there will be more after this. I think that was the question.” To which Scott replied, “If this is successful, and then the next one, and then there will definitely be three more.” While those answers all seemed like they came in pieces, what we got out of it was that there may be another Alien movie called Alien: Awakening, and it may either come after the events of Covenant or between Prometheus and Covenant. And that the next one would complete a trilogy, at which time Scott has another three Alien films in his mind.